To his credit, Director Jason King Jones’ iteration on Olney’s Main Stage stays mainly true to the beloved musical—considered one of the all-time most popular Broadway productions internationally and in the U.S. Mr. Jones, who helmed Mary Poppins last year at Olney, skillfully guides a wonderfully talented cast and crew in this joyful, smoothly presented production. 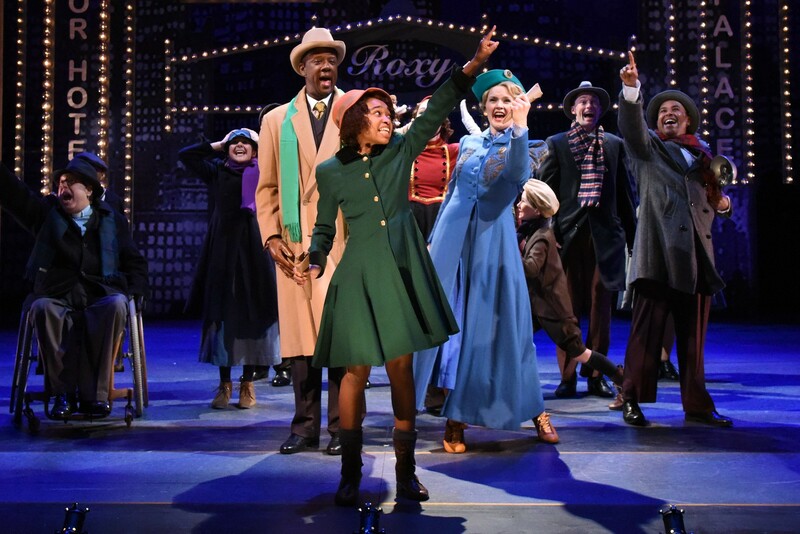 The forty year-old, seven-time Tony Award winning classic is based upon the popular Harold Gray comic strip “Little Orphan Annie,” with music by Charles Strouse, lyrics by Martin Charnin, and book by Thomas Meehan. The story centers on a plucky, adorable 11 year-old girl, Annie, brimming with contagious optimism, whose parents dropped her off at an orphanage in New York City. From that venue during the depths of the Depression, Annie's shining personality and upbeat demeanor ticks off the orphanage’s matron, the cruel Miss Hannigan, and ultimately wins over the heart of billionaire factory mogul Oliver Warbucks (and just about everyone else including President Franklin D. Roosevelt) while trying to find her parents whom she believes are still alive. A terrific score highlights the musical with the iconic “Tomorrow” leading the way. Other songs, such as “It’s the Hard Knock Life,” “N.Y.C.,” “Easy Street,” “Maybe” and “Something Was Missing” are also solid. Led by Musical Director Jay Crowder, Christopher Youstra’s nine-piece orchestra proficiently supports the vocals. Rachel Leigh Dolan choreographed with precision, and such numbers as “Little Girls,” “I Think I’m Gonna Like it Here,” “N.Y.C.” “Easy Street” and “You’re Never Fully Dressed Without a Smile” are meticulously executed by the talented leads and ensemble. 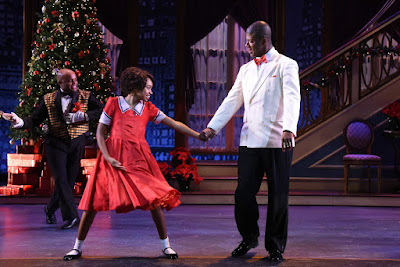 Young Noelle Robinson, whom local theatre-goers may remember as endearing Lil Inez in Hairspray at Toby’s Dinner Theatre earning her a Helen Hayes Award nomination, hits it out of the park in the title role. At a young age, her already skilled acting prowess and dancing skills are clearly on display. As billionaire Oliver Warbucks, who is so powerful that he can casually drop in on the President and summon the FBI to find Annie’s parents, Kevin McAllister couldn’t be better. 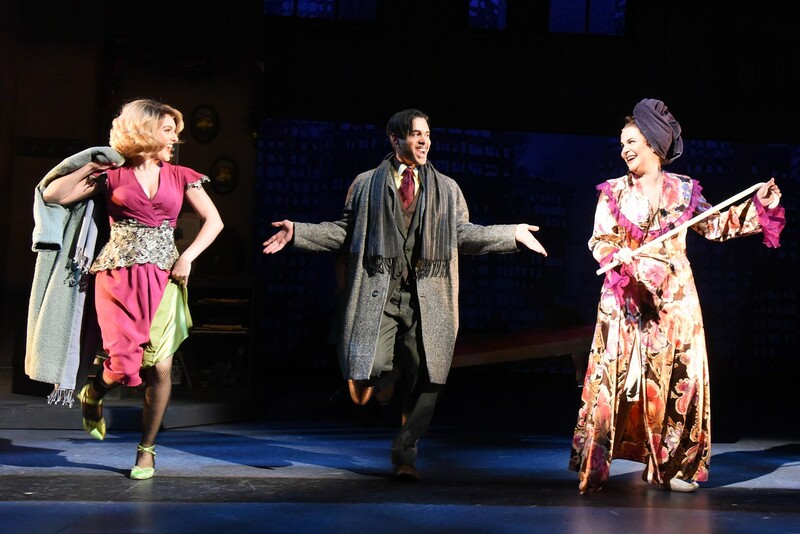 Using his potent acting abilities, Mr. McAllister, a 2016 Helen Hayes Award winner in Ford Theatre’s Ragtime, perfectly plays the stiff, cold, demanding tycoon in need of adopting Annie to soften his thick-skinned image. Mr. McAllister’s opera-quality baritone is simply magnificent and shines particularly in the tear-inducing “Something Was Missing” where he tells Annie how much he loves her. Rachel Zampelli, a seasoned performer who is well-known in DC-area theatre from portraying Eva in Evita at Olney, romps through her role as the villainous Miss Hannigan. When the matron of the orphanage is not berating the children and forces them to tell her they love her, she is hitting the bottle and hits on just about any male who comes to the door. She teases the children by telling them “no hot mush today” to which they cheer and celebrate only to find out she will be serving cold mush instead. You get the picture. 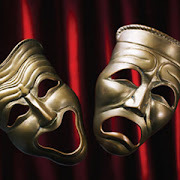 Ms. Zampelli’s comedic skills are showcased with impeccable timing, facial expressions and body language throughout. Her clear soprano voice also scores high marks in “Little Girls” and a reprise of “Easy Street” with Wilson Jermaine Heredia as Rooster, Miss Hannigan’s brother, and Dani Stoller as Lily, Rooster’s “hen” you can say. Mr. Heredia, a 1996 Tony Award winner as well as the recipient of other honors for his role as Angel in Rent, is effective as the conniving Rooster, a small-time crook and ex-con. He along with Lily devises a plan to swindle Warbucks’ $50,000 reward by impersonating Annie’s parents, but to no avail. The trio’s work in the number “Easy Street” is sterling. Other standouts in the large cast include Karl Kippola as Warbucks’ butler Drake; Rob McQuay as FDR; Alan Naylor as Bert Healy, a radio announcer who broadcast Annie’s search for her parents; and Emily Madden, Julia Lancione and Ashleigh King as the Boylan Sisters who appear on Healy’s radio show. The remainder of the cast is outstanding and in particular, the young girls who play Annie’s orphan friends on a rotating basis. And let’s not forget the trained pooch which plays Sandy, also alternately. The entire ensemble is attired in exceptional period costumes designed by Seth M. Gilbert. Daniel Ettinger’s scenic design is well constructed with drop-down scenery and moveable set pieces seamlessly transforming the multitude of scene changes to include a dingy, Depression-produced “Hoovertown” locale, to Warbucks’ great room in his mansion, to the Oval Office in the White House. Sarah Tundermann’s lighting design and Roc Lee’s sound design cap off a terrific effort by the technical crew. Annie hasn’t lost her magic over the past 40 years. The timeless feel-good story with memorable music and choreography couldn’t come at a better time. Under Jason King Jones’ direction, the exceptional cast and crew at Olney did justice to the classic Broadway smash. Annie should not be missed. Get your tickets—tomorrow. Bet your bottom dollar you’ll enjoy it. Annie runs through December 31 at the Olney Theatre Center, 2001 Olney-Sandy Spring Road, Olney, MD 20832. Tickets may be purchased by calling 301-924-3400 or by visiting online .